Lake Champlain's diverse warm-water fishery includes several members of the Esox genus of fish, more commonly referred to as the pike family. These fearsome torpedo shaped predators are known for their razor sharp teeth and vicious last second strikes. Seven species of this elongated freshwater fish exist on earth today. They include the muskellunge (Esox masquinongy), northern pike (Esox lucius), southern pike (Esox flaviae), amur pike (Esox reichertii), chain pickerel (Esox niger), redfin pickerel (Esox americanus) and grass pickerel (Esox americanus vermiculatus). Not all of these seven species inhabit Lake Champlain. The three most predominant Esox in the Champlain watershed are the muskellunge, the northern pike, and the Chain pickerel. There are less copious populations of redfin pickerel in the lake. The largest of the three predominant cousins, the muskellunge, is found primarily in river systems. Muskellunge were at one time native to the Champlain basin and plentiful in several tributaries. It is thought that this indigenous population was of the same strain native to the Great Lakes and the St. Lawrence River. Since the mid 1960's the New York State Department of Environmental Conservation has been stocking the Ohio River strain in the Great Chazy River where there now exists a relatively healthy population. That same Ohio River strain was also introduced to Chautauqua Lake years ago and it is from this lake that NYDEC currently obtains its stocks to supplement the Great Chazy River. Lake Champlain is not only managed and stocked by New York State's fisheries staff. A cooperative management effort exists on this bountiful watershed that borders New York and Vermont. Another stocking program on the Vermont side of Lake Champlain occurred in the 1980s when fish obtained from Pennsylvania were stocked in upper Otter Creek. This population has been self-sustaining and has now spread downstream inhabiting the lower river as well. The Vermont state record muskellunge is also considered by many to be the Lake Champlain record since it was caught below the first barrier of the Misissquoi River, another primary lake tributary. That landmark fish, caught in the early fall of 2005 by Chris Beebe, weighed in at 38.22 pounds! Genetic testing of the specimen showed that it was of the strain stocked by New York State fisheries managers in the Great Chazy River and may have subsequently migrated to the Missisquoi. The last known native population of muskellunge in Vermont inhabited the Missisquoi River above the Swanton Dam. In 1979 that small indigenous stock was poisoned and wiped out by a pollution spill. Efforts to take down the Swanton Dam are supported by most anglers, wildlife officials and fisheries managers because the removal will restore miles of spawning habitat for muskellunge as well as Atlantic salmon, sturgeon and walleye. In 2008 a management program was established by the Vermont Fish & Wildlife Department to reintroduce muskellunge into the Missisquoi River and its delta. 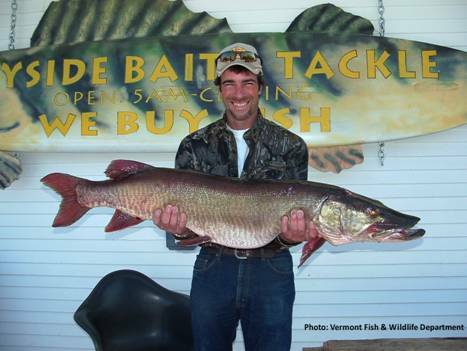 It is important to note that if a muskellunge is caught in Vermont waters, it must be released. The Vermont Fish & Wildlife agency has implemented a mandatory catch-and-release regulation on these fish while their restoration program is underway. Harvest is prohibited so anglers should take the time to familiarize themselves with the proper identification of the various members of the pike family (see below). If a fisherman catches what they believe to be a muskellunge while fishing the Vermont side of Lake Champlain, the Vermont Fish & Wildlife Department would like to know about it. The agency requests the angler to do the following. Take a clear side-view photograph of the fish. Notify biologist Shawn Good at (802) 786-3863. Northern Pike are the most abundant member of this genus. They exist naturally throughout the entire lake basin. These fish can reach over 45 inches in length on Lake Champlain. Several over twenty pounds have been recorded. A trophy specimen in the 38 inch range will often weigh over ten pounds. Virtually all of the pike this size and larger are females, a consideration that sportsmen should take into account when determining which fish to keep for supper. The northern pike gets less respect than it deserves for the food value of its meat. Although it is difficult to clean due to an extra row of y-shaped bones along the top of its flank, it has a delicate and mild tasting flesh when properly filleted, skinned and cooked. For many years it was an acceptable practice to spear and even shoot these fish when they came into the shallow spawning flats of the lake and river deltas. This controversial tradition continues in Vermont where there is a season, exclusive to Lake Champlain, which remains in place for shooting northern pike. 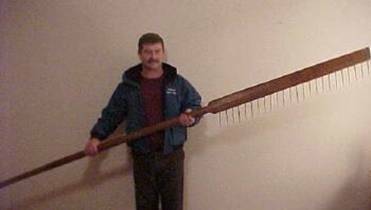 Pictured above is a "pike paddle" in years past this very paddle was used on the south end of Lake Champlain to navigate in the shallows and harvest spawning pike as they lay stacked up in their spawning beds. The narrow paddle is equipped with 6 inch spikes to rake in fish! Chain pickerel are a typically smaller and more nervous member of the genus. They average from 15-22 inches in Lake Champlain. Their edginess may be a result of their being a couple notches below the top of the food chain, and as such, they're prey for their larger relatives. 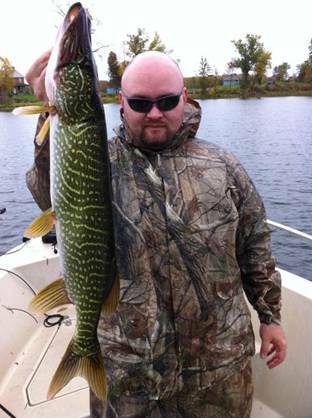 On more than one occasion our clients have been reeling in pickerel or small pike and had larger pike attempt to inhale the hooked fish they were retrieving. It's certainly a "dog eat dog world" when it comes to these toothy predators! Novice anglers who land these various species can have a difficult time sorting out exactly which fish they caught. While individual fish markings are as unique as fingerprints are to humans, there are typical characteristics that distinguish one specie from another. 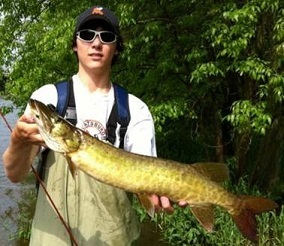 The muskellunge has a brown tint overall with darker vertical bars on its side and a clear brownish orange tail. 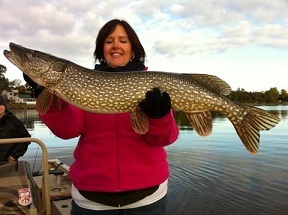 Northern pike are generally greyer in color and have light oval shaped spots in various horizontal patterns. Their tail has dark streaks scattered through it. Chain pickerel are green and yellow in color with a horizontal chain like pattern on their flank. A pickerel's tail is void of streaks. It will always exhibit a dark tell-tale teardrop stain beneath its eyes. After boating hundreds of pike and pickerel each charter season it becomes obvious to this Captain which is which, but sometimes we catch a cross between the northern pike and chain pickerel, a hybridized version, with an odd mixture of characteristics and diagonal lines on the flank. These hybrid fish also have a unique forked tail. Hybridization of the Northern pike and chain pickerel occurs naturally on the shallow flats when the milt of the male pickerel fertilizes the eggs of the female pike during an overlap in their respective spawning seasons. There is no need to travel deep into Canada to tangle with trophy sized members of the pike family. 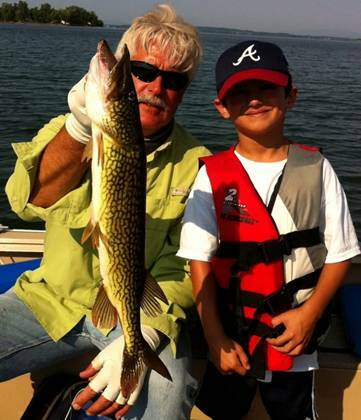 Lake Champlain has an outstanding pike fishery and a charter service that specializes in putting its clients on big northern pike and rare hybrid pike/pickerel. Regardless of which member of the Esox family you run into on Lake Champlain you'll be amazed by their beauty, ferocity and power. They are a go-to sport and game fish that will challenge any angler's skills and provide excitement throughout the day and even into the night. They're sure to keep you on the edge of your seat in anticipation of your next encounter!